Our full guide to setting up and using the My Disney Experience app for the Walt Disney World resort in Orlando, Florida. We guide you through setting up and using the My Disney Experience app to complement your Disney World holiday. If you haven't already, you need to link your holiday to your My Disney Experience account. When you've done that, you can download the free Disney app from your app store. Search 'My Disney Experience' or 'Disney World' to find it. Once downloaded, you can login to your Disney account and view your reservations and everything else relating to your holiday. Firstly, if you haven't already, you'll be asked to login. If you're using a phone that supports it, enable TouchID for quicker login capabilities in the future. You'll then be taken to your account overview page. Here you will find quick links to your account options, today's showtimes, park hours, your tickets and more. Below that you'll see a "My Plans" section. Here is where all your reservations will be listed. Scroll down a little more and you'll see your next dining and hotel reservation if you have one. Below that will be your Photopass and Memory Maker section, and after that will be spotlight and other Disney service offers. Before going into these options, you can swipe down on the welcome page (or click the green area at the top) and you'll be taken to a map of the Disney World resort. 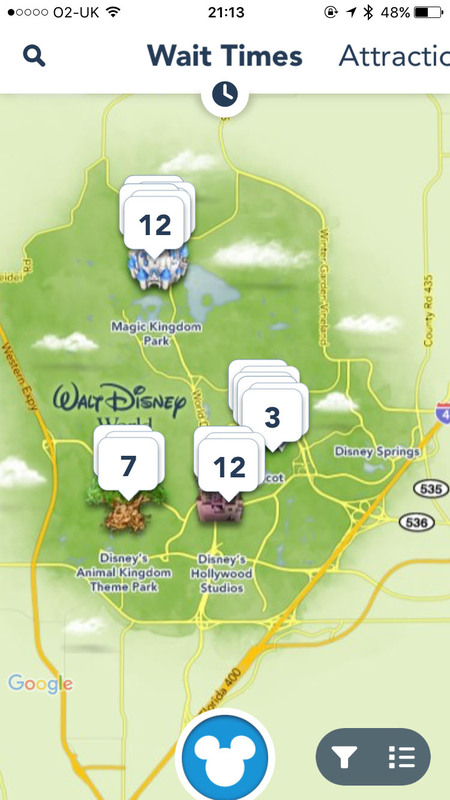 The default map option will be wait times, scroll across the top to see other options like attractions and characters. Use the search icon on the top left to search for something, and use the funnel icon on the bottom right to filter your results, or click the line icon see your options in list form. Back on the main page, we'll walk you through what each of the options allows you to do. Clicking "My Account" below your name at the top will take you to a page where you can edit your own details, view and customise your magic bands, add a payment method, add family members, and more. This page lists all of the shows that will be on at the park and date you have selected. This page shows the park hours, including extra magic hours. This won't apply to us brits unless you're a regular, but it's a page for the (mainly) Florida residents to see what dates they can visit with their annual passes. Now we're heading into the "My Plans" section. To quickly see a list of all your booked plans, click the "See All Plans" link. 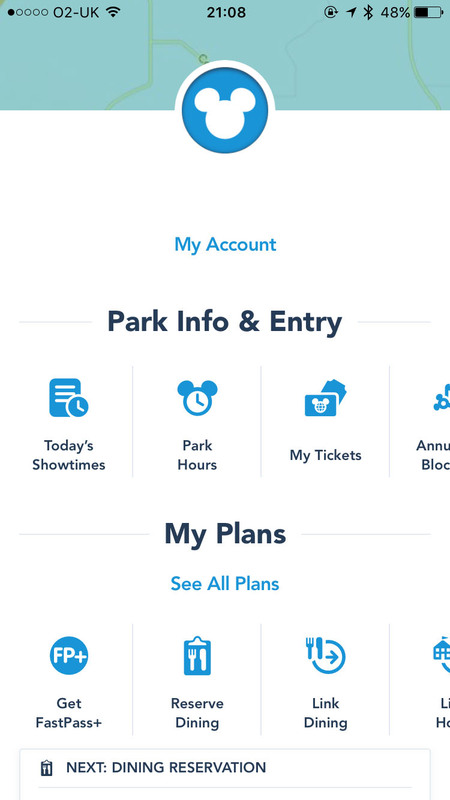 When you are able to start booking your Fastpass, you can do it straight from the app using this link. 180 days before your check in date you can start making restaurant reservations, you can also do this from the app. If you have made a dining reservation through another method, like a travel agent or over the phone, you can link it to your account here. The same goes for linking a hotel booking. You can click on your reservations to view the full details, as well as seeing your tickets and any other extras you've purchased for your trip. The Disney World app is good for 3 things. Making reservations, viewing reservations and viewing ride wait times. You can make restaurant and Fastpass+ reservations right from the app. 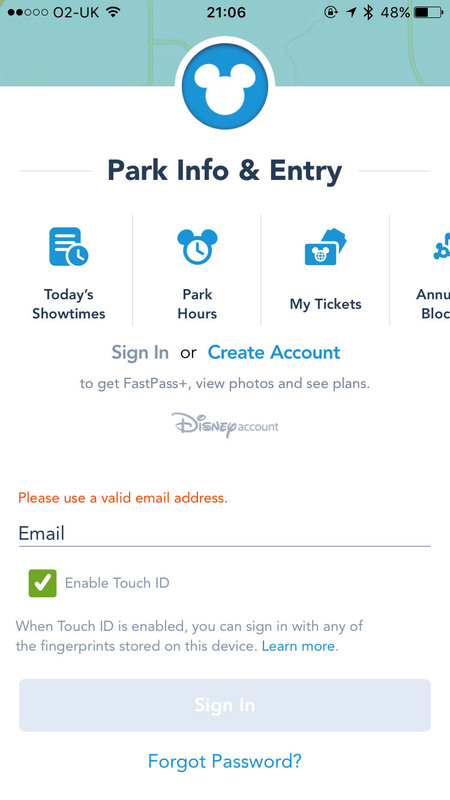 This is especially handy because once you've used your 3 Fastpass+ for the day, you can use the app to book another one while you're in the park. It is also a great way to keep track of your reservations. Back in the day we had to print out our reservation times to try and remember the times of our bookings, but those days are gone! Just login to your app and view your reservations. The final great thing about the app is viewing the ride wait times. If you've gone back to the hotel to chill out in the middle of the day, and have no dining or Fastpass+ reservations for the afternoon, you can view the app to see which park is the quietest for your afternoon visit. Of course, you can view the wait times any day of the year, even if you're home. Which we totally don't do.